I want to end this series of posts about new features of qTrace 2.0 by discussing one last feature: the ability to export and import qTrace configuration settings. As like most features we introduced in qTrace 2.0, this is also a feature requested by many of our customers. While qTrace is very easy to use, configuring it properly so that it works with your defect tracker and development process requires some upfront effort. For instance, you have to specify proxy information if you are behind a proxy, input correct service URL for the tracker, configure how qTrace output will be submitted (i.e. include trace steps or not, which image quality to export, how to number steps etc. ), specify which system information elements to include and select among the many dozens of fields that the tracker in question has etc. Now, if you have a team of many testers, that’s a lot of repeated configuration work to do. Not to mention, it is very difficult to enforce certain development workflow consistently across all team members if each has to do his/her own configuration. Since qTrace 2.0, a tester (usually Test Lead or Manager) can take care of the configuration and then export qTrace settings to a file so that other testers could use. Better yet, qTrace allows a very fine-grained level of control as to what settings you want to export, so you don’t have to worry about exporting more than what are absolutely necessary. 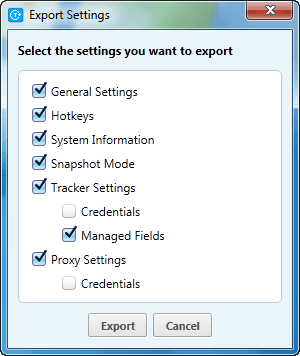 To export settings, click on the drop-down arrow next to the Settings button and choose Export. A dialog is shown, allowing you to select what kind of settings you want to export. 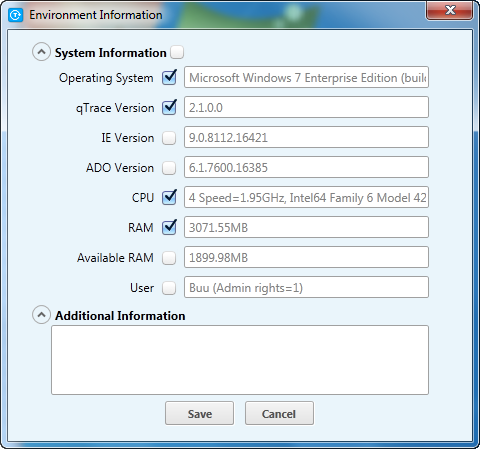 Also note that System Information only exports the element names selected in the System Information section of the Environment Information screen, not their values which differ for each machine. For example, if you have configured System Information like below, qTrace will export the elements Operation System, qTrace Version, CPU and RAM. When another tester imports the settings, she will have these elements checked, but their values are retrieved from her computer. The remaining settings are much straight-forward: they map one to one to each tab in the Settings screen. Once you have select the settings to export, click Export and qTrace will allow you to save the settings file which you can store in a network drive or share to others via email. Any tester can then import the settings file by clicking the drop-down arrow next to Settings button, click Import and select the file. That’s it, a simple but highly useful feature for any development team. Go ahead downloading qTrace 2.0 if you want this feature.